Hi everybody! My name is Anne and I’m the Sewing Editor over at Craft Gossip. I’m super excited to share one of my favorite tutorials with you here at Squiggly Twigs. I’ve been a fan of Debbie’s for a while now. She makes such beautiful things – skirts and dresses and hairclips and more! And I love that the focus of her tutorials and ePatterns is on building sewing skills and confidence. 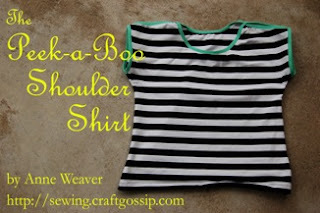 So today I’m sharing the tutorial for my Peek-a-Boo Shoulder shirt. 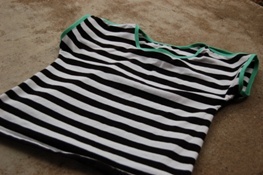 The shape of this shirt was inspired a top I saw in a Tea Collection catalog. (http://www.teacollection.com/product/1s12015/girls-shirts-mariposa-top.html) It was cute enough, but $29 for a child’s top (it’s now reduced to $19.50) is a bit steep for my budget. And the lines are so simple! I decided it would be easy enough to make one myself. Even though the one I made is in a child’s size, there’s no reason that you can’t follow the same process and make one for an adult. 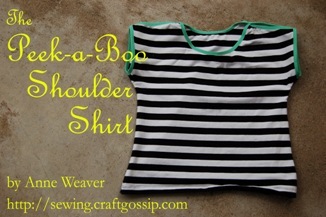 I call my version The Peek-a-Boo Shoulder shirt because the tops of the shoulders are left open. You can make one out of knit yardage, or if you’re making a child-sized shirt you could get your knit from a larger tee. You'll need either jersey knit yardage or a t-shirt large enough to cut your pieces. (Size needed will depend on the size of shirt you're making.) You'll also need some foldover elastic to bind the edges. I used less than 2 yards to bind the edges in the child's size 6 shirt I made. Now that you've got your materials, let's draft the pattern. This is a super easy pattern to draft. 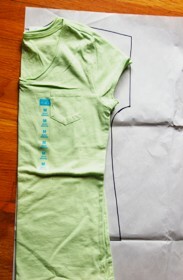 Get a t-shirt that fits and draw a boxy short-sleeve shape using the t-shirt as a guide. You'll notice that the one I drew is wider than the shirt. That's because I used a shirt that's fairly fitted and I wanted the shirt I'm making to be boxy and loose. You'll also notice that I didn't draw a separate front and back. 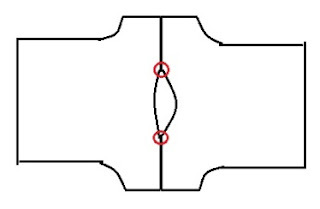 The front and the back are the same shape, except for the neckline. 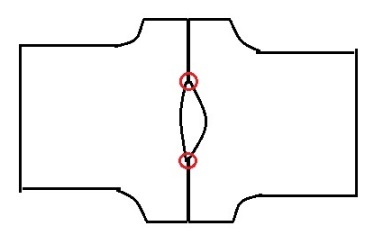 If you cut the pattern on the taller (back) neckline, then you can cut two pieces at the same time and then adjust the neck on one of them to make the front. Now let's sew this baby together. 1. Adjust the neckline on the front piece, making sure that the neck will be big enough to go over the head. I check this by pinning the shirt together at the shoulders and sliding it over the head. If it's too tight, just cut the neck deeper or wider. If you've never used foldover elastic before, it's really simple to do. 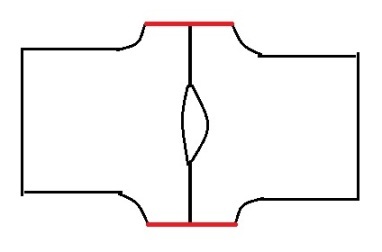 There's a line woven down the middle of the elastic. 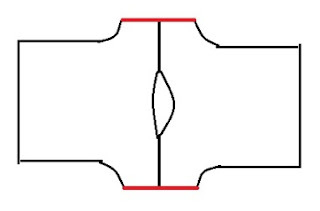 This is the fold line. Wrap the elastic around the edge of the fabric with the fold line aligned with the edge of the fabric. Hold it in place with your hands and zig zag it in place. Easy peasy. If you want to see how it's done, check out this video tutorial by Grosgrain. Her video shows the elastic being stretched as it's applied. This will create a gathered edge. For this project, we want a smooth edge so don't pull the elastic as you stitch it down. If you don't have any foldover, you could also bind the edges with strips of knit fabric. This binding tutorial at Gorgeous Things shows how to do it. 3. Tack the front to the back at the neck with a couple of hand stitches. 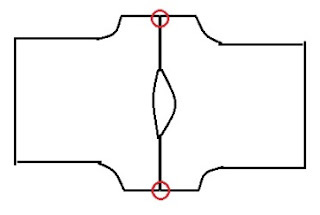 You'll need to overlap the two pieces slightly. 4. Now tack them together at the sleeve bottoms just like you did at the neck. 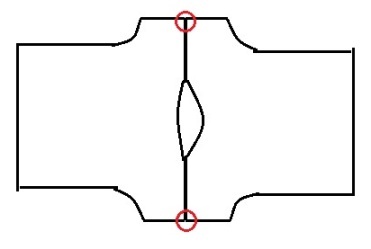 You may need to trim a little off the ends to make the front and back exactly the same length before doing this step. 5. It's time for some more binding. This time, bind the bottoms of the sleeves. 6. 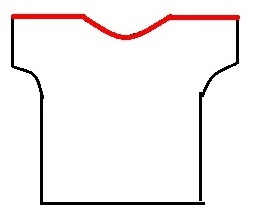 Lay the shirt out flat, with right sides together. Sew the side seams. 7. If you used a repurposed shirt, you're done. 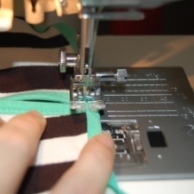 If you working with yardage, fold up a small hem and stitch it in place with a zig zag. See? I told you it was easy!! Thank you so much to Debbie for allowing me to share my project with you today!